In 1980 Philip Crosby introduced a book titled, Quality is Free, the Art of Making Quality Certain. His message was straightforward: if you are consistently and effectively doing all of the basics there is no additional or incremental cost of quality—it is inherent to the organization. Today, 36 years later, we are fixated on the cost of reliability and how much of an investment must be paid to achieve it. We struggle to build a business case to justify implementation of one or more programs that purport to create reliability. 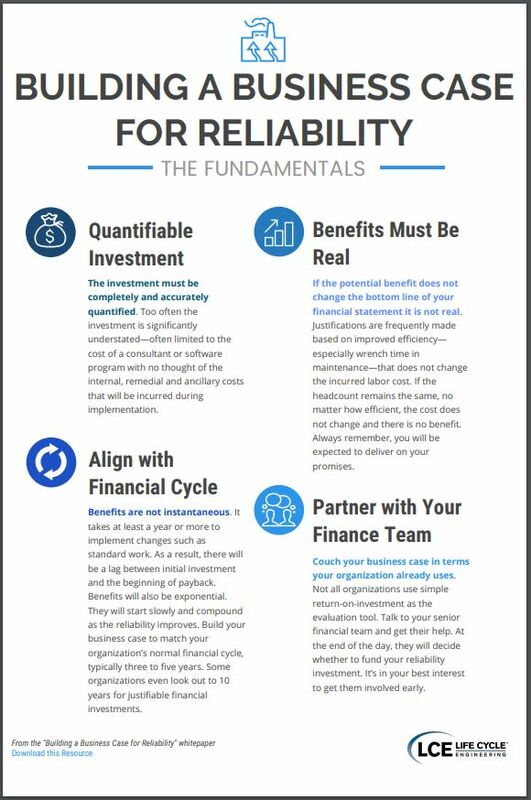 If your organization is already consistently doing everything from strategic planning to maintenance effectively, the cost of reliability is zero—it is already a part of its DNA and there really is no reason to build a business case. However, if your organization is not one of the fortunate few that are already reliable, then change—perhaps small, perhaps quite large—will be needed and there will be associated costs. This is not a cost of reliability, but rather an investment required to become reliable. If this is the case, then building an accurate business case is essential. But where do you start? Common sense dictates that you begin by identifying the gaps between a truly reliable organization and your current operation. Benchmarking is one approach that can be used, but it must be used with extreme caution. It is virtually impossible to find a reliable operation that is identical to yours. While it might be in the same industrial classification, differences in size, location, mode of operation and many other factors can badly skew the comparison. Benchmark comparison, done correctly, can be a valuable tool, but should be used only to identify potential opportunities for reliability improvement and not as the basis for a business case. If benchmarking is not the answer, then how does one build a business case? The most logical approach is to identify the gaps and their forcing functions. Where are your losses, where is your waste, and where are your reliability issues?